On May 17, 1718, French settlers at the mouth of the Mississippi River formed a new city. It was named in honor of France’s Philippe II, the Duke of Orleans. In its chaotic first century, New Orleans planted the seeds of its deep and diverse multicultural roots, passing from French to Spanish to American rule, escaping British invasion and unfortunately, serving as a hub for the African slave trade. The modern era saw continued influxes of immigration, most notably from Sicily and Vietnam. Many cities claim diversity, but here it morphed into uniquely original traditions permeating virtually every aspect of life. From architecture to attitude, cuisine to culture, the old tradition forged by immigrants created a new magic indigenous to New Orleans. As NOLA celebrates its tricentennial throughout 2018, it will really be reveling in a homegrown way of life that is much more than the sum of its parts. And everyone’s invited. In a city of neighborhoods and cultures that are both distinct and hopelessly blurred, nothing better reflects the gumbo of ingredients comprising New Orleans than its many nicknames. Most metros are content with one: Paris is the City of Lights; Chicago is the Windy City—but not here. New Orleans has its own shorthand: NOLA. It has a geographic description: The Crescent City; a musical nod: The Birthplace of Jazz; and most tellingly, two nicknames entirely based on its aggressively laid-back attitude: The Big Easy and The City that Care Forgot. 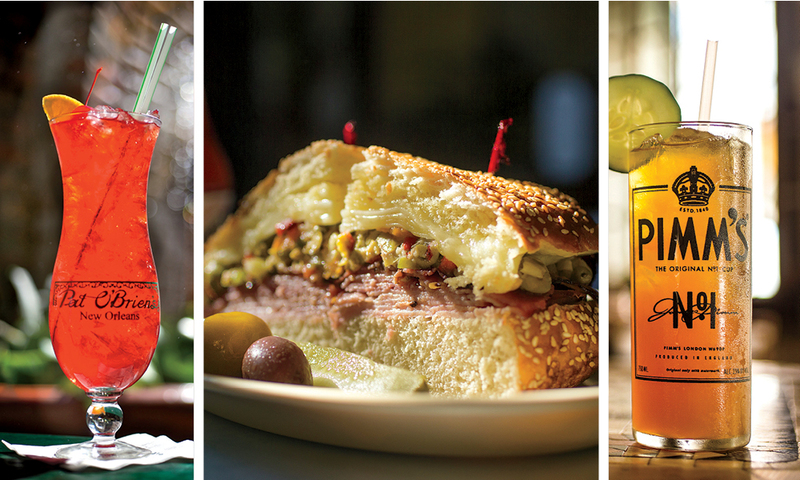 The Napoleon House captures the essence of the Crescent City, serving up quintessential New Orleans food and drink. Visitors will find they cannot simply “see” New Orleans in a weekend (or in a week), but they can experience a savory morsel. The upside is the city’s draw will inevitably mean they’ll be back for more. A trip could focus entirely on one of the city’s most passionate essences: food, music, art, shopping or history, but a visit during the tricentennial is the best way to take in a slice of it all. The city’s laissez les bon temps rouler motto will roar louder than ever for its benchmark birthday. Events and programs will honor the anniversary of its founding in a manner that would make Mari Gras held any other year seem tame. A variety of special events, concerts, fireworks and festivals will propel the city into the next three centuries—but tradition still serves as the base and the tried-and-true attractions will entertain visitors no matter the time of year they come. Jazz is the city’s highest profile invention, credited to the fact that this was the only place in America where slaves could own drums, pounding out rhythms inspired by their homelands. The vast European population’s penchant for horns and brass got crossed with the percussion. Music was never the same. 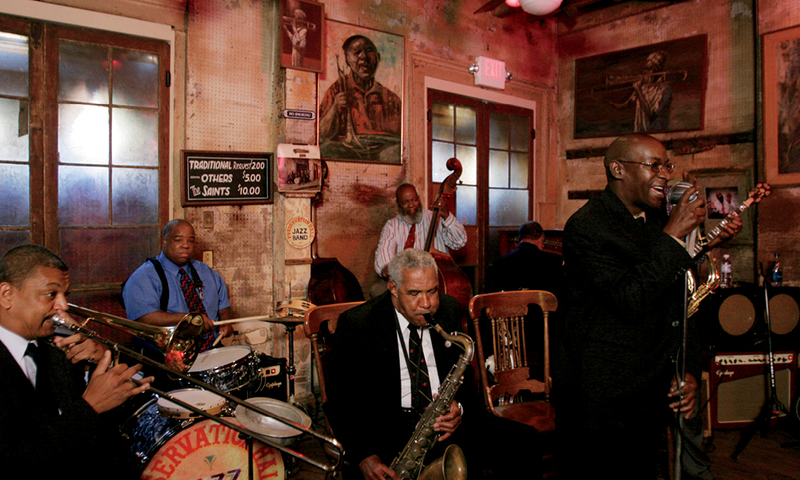 The top spot to take this all in is Preservation Hall. The intimate, non-profit performance venue in the French Quarter was built more than 50 years ago to (as name suggests) preserve New Orleans jazz. 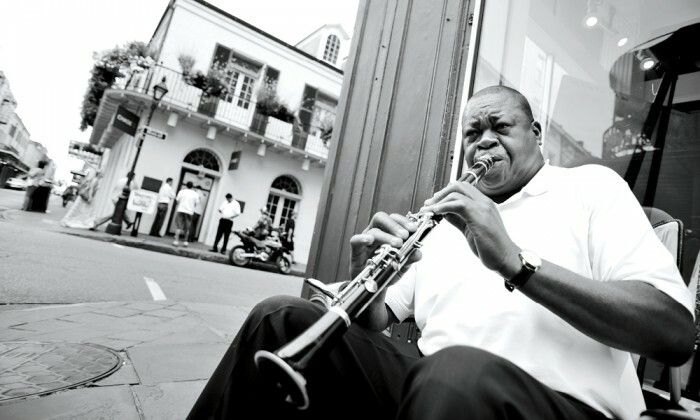 The world-class Preservation Hall Jazz Band, along with special guests, hosts 45-minute shows nightly on the hour from 5pm-10pm. Preservation Hall lives true to its name, preserving the art of jazz, as only New Orleans can produce. Bars that host live performances by local talent are the beating heart of the city’s music scene. 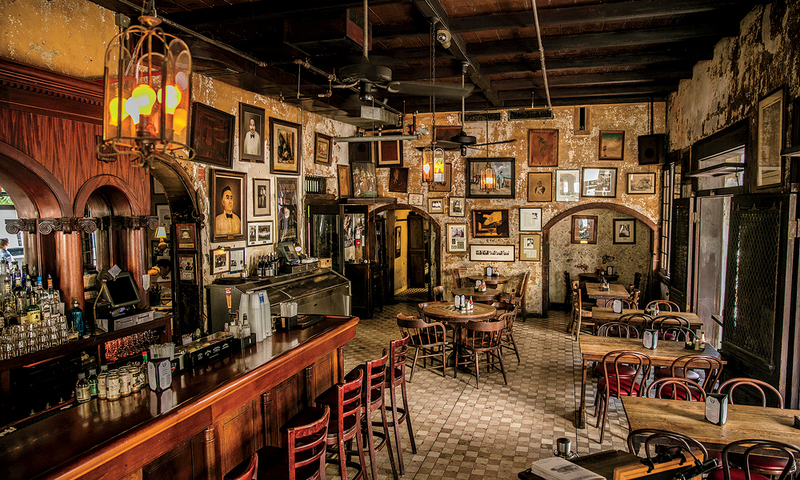 The most frequented by out-of-towners are Snug Harbor and the Spotted Cat, located along a two-block stretch of jazz spots on Frenchmen Street abutting the Quarter. Further afield, tourists and locals alike catch the city’s biggest names kicking back in neighborhood watering holes. World-renowned pianist and Grammy winner John Cleary tickles the ivories most Tuesdays at Chickie Wah Wah in Mid-City, while legendary jazz trumpeter, singer and composer Kermitt Ruffins favors Bullet’s Sports Bar in Treme (featured in the HBO series named for the neighborhood). The Rebirth Brass Band, co-founded by Ruffin, also frequents the Maple Leaf Bar in Uptown’s Carrollton district. New Orleans likes to imbibe and it’s never too early. It is no coincidence that the biggest affair for the nation’s bar industry, Tales of the Cocktail, is held here annually. A cocktail crawl through history is a colorful way to experience the drink scene. The most famous homegrown tipple is the sazerac, dubbed “America’s first cocktail.” The drink is a riff on the Old Fashioned made with cognac, a splash of absinthe, a sugar cube and dashes of Peychaud’s bitters (also invented in New Orleans). The birthplace is long gone, but the preferred place to try one is the Roosevelt Hotel’s historic Sazerac Bar which, despite its name, gave us a different local icon: the Ramos Gin Fizz. This was the preferred drink of Louisiana Governor and U.S. Senator Huey Long. A bullet hole still visible in the bar’s wood paneled wall was supposedly fired at Long, but this story is likely apocryphal. The cocktail however, is real, and not one too many folks attempt at home. Considering it takes exacting measures of gin, frothed egg whites, fresh lime and lemon juices, simple syrup, heavy cream and “orange flower water,” it’s best to try one by expert hands while you’re in town. Other homegrown drinks include the famous (albeit touristy) hurricane, a sugary concoction to be sampled at least once, mainly to say you tried it, at Pat O’Brien’s on Bourbon Street. The far less well-known Grasshopper mixes green crème de menthe and white crème de cacao. It comes from Tujague’s, another French Quarter landmark. Finally, although imported from overseas, two adopted cocktails have become such local staples they might as well have been invented here and they’re worth their sips: the Pimm’s Cup at the Napoleon House and the champagne-based French 75 at Arnaud. French 75 is preferably paired with the bar’s famous (and downright addictive) soufflé potatoes, which will turn you off chips forever. Pat O’Briens on Bourbon Street is the place to try the sugary delight known as the hurricane. // Fear not, everything goes well the muffuletta sandwich. // If it’s a slightly more elevated beverage you crave, try the Napoleon House’s Pimm’s Cup. Oh, speaking of the food! Often imitated but never quite matched is the spectacular muffuletta sandwich that depends on two elements for its success: a special roll made only at Louisiana bakeries and the olive relish. Created by Sicilian immigrants at Central Grocery, this original with secret recipe relish is still the best on earth and there’s a line out the door until they sell out—they serve nothing else. Prepared and flambéed tableside in an impressively fiery show is the Bananas Foster. It was invented locally at Brennan’s in 1946 but is served at every fine dining spot. New Orleans is mad for Gulf oysters too. The birthplace of the Rockefeller style is Antoine’s, also in the Quarter. Other must-try dishes deeply associated with New Orleans include the po’ boy sandwich (ideally at Parkway, where Obama went for his); BBQ shrimp (Emeril’s restaurant is famous for the dish); gumbo (served everywhere, but renowned at Dooky Chase’s) and the heavenly sugar coated clouds of fried dough known as beignets (available 24/7 at Café du Monde). It helps that all these restaurants are stars, serving great food far beyond their historic signatures. Newer, trendy casual spots include Turkey & The Wolf and Cochon Butcher. Because it is a city of neighborhoods, it is vital to explore all of them to really experience the city and grasp its diversity. The Quarter is wonderful, but it’s only a square mile. The fabulous National World War II Museum anchors the burgeoning Warehouse Arts District along with several art museums. Treme has become hot, and the lower Garden District has long been one of the most popular neighborhoods. Magazine Street (top for shopping) runs seven miles from the Quarter all the way through Uptown. Since it is almost completely flat, one of the best ways to get a good overview of all the neighborhoods is on a bike tour with award-winning Confederacy of Dunces, named for the Pulitzer Prize-winning novel about the city. They theme tours around eating and cocktails with local flair in neighborhoods beyond the Quarter, have excellent guides, promise you won’t get too much exercise and eagerly point out that drinking a daiquiri from an open container while cycling is very much legal. If money is no object, the top lodging choice is the Windsor Court, a venerable, mansion-like former Orient-Express hotel just across the street from the frenetic French Quarter. The Royal Sonesta and Mazarin are other top-notch accommodations in the Quarter, but unless you like it loud and crowded, it’s better to stay elsewhere. Several notable new boutique hotels opened in anticipation of the big birthday bash, most with convenient locations in the Central Business District (between the Quarter and Warehouse Arts). NOPSI is one of the best. Housed in the historic former New Orleans Public Service, Inc. headquarters, its charming architectural elements are made better by its modern enhancements. The updated hotel offers great food, a great bar and wonderful rooftop pool. The year old Troubadour is another grade A newcomer that boasts one of the best rooftop bars in town.